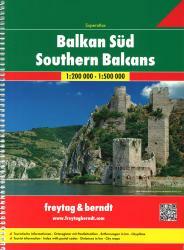 Explore the Balkans and South-East Europe with this Freytag & Berndt road map - the best way to prepare your trip, to plan your itinerary, and to travel independently. This map covers the following countries: Greece, Albania, FYROM, Bulgaria, Kosovo, Serbia, Montenegro, Bosnia Herzegocina, Croatia, Slovenia, Hungary, Romania, Moldova, the Czech & Slovak Republics, Western Turkey, Western Ukraine, Austria, and Southern Italy. The map includes a localities index (attached booklet) and more detailed city maps of Athens, Belgrade, Bratislava, Bucarest, Budapest, Chisinau, Istanbul, Kiev, Ljubljana, Podgorica, Prague, Pristina, Sarajevo, Skopje, Sofija, Tirana, Vienna, and Zagreb. The legend is in 10 languages (English included). Paper road map in protective cardboard cover with attached index booklet. Covers all of southeast Europe. Spiral-bound road superatlas of the Southern Balkans, covering Serbia, Montenegro, Kosovo, Macedonia, Albania, Bosnia-Herzegovina, Greece, Bulgaria, and Romania. Each country has a separate section. Includes index. Legend in 10 languages. Scales are 1:200,000 or 1:500,000, plus a section for vicinity maps in 1:1,000,000. Road map of the Balkans regions with place names index. Map and index continued on reverse. Waterproof and tear-resistant. The map is packaged in a 2"-diameter clear plastic tube. The tube has a decorative label showing a thumbnail of the map with dimensions and other pertinent information. The Countries of the Balkans wallmap features thousands of place-names, political boundaries, national parks, and major infrastructure networks such as roads, canals, ferry routes, and railroads. The region's diverse terrain is detailed through shaded relief, coastal bathymetry, and symbols for water features and other landforms. Elevations of major peaks as well as depth soundings are expressed in meters. The signature Classic style map uses a bright, easy to read color palette featuring blue oceans and stunning shaded relief that has been featured on National Geographic wall maps for over 75 years. Wondering what to read when visiting the Balkan Peninsula?